Since closing the gallery at the end of 2018, I've been working at clearing things out and it's taking more time than expected, but it's moving along. I'll be doing some work on the website in the near future with some updates and additional features, so please check back often. With the renewed interest in the bayfront, I decided to place one of my older drawings on my home page. 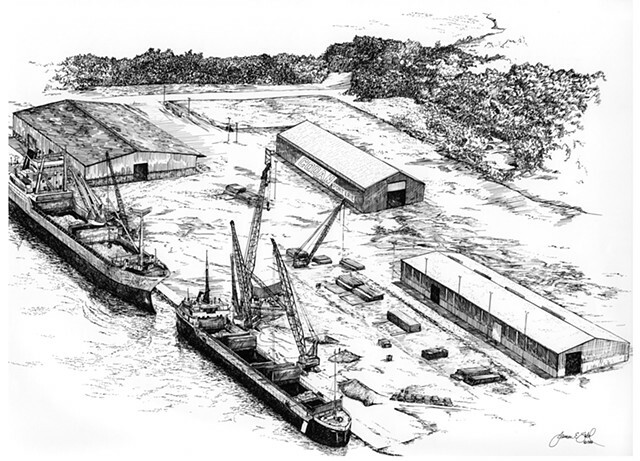 This drawing of cargo vessels docked at the Codan facility was commissioned by the company to illustrate their capabilities and facilities. The image was sent to international and national clients. Since 1980, I've been fortunate to have been commissioned to create original drawings for many private collectors, as well as many of Erie's educational institutions, hospitals, banks, churches, corporations and businesses. Each of these were unique and challenging in their own way. Thank you for all of your confidence and trust. To everyone who's purchased prints, notecards, shirts and of course, ornaments, thank you! Over the years, I've gotten to know so many of you, and I truly appreciate your friendship and good wishes. WHETHER YOU CAME IN FOR THE ORNAMENTS ONLY OR FOR PRINTS, ORIGINAL DRAWINGS, NOTECARDS OR SHIRTS, THANK YOU FOR YOUR PATRONAGE THROUGHOUT THE LAST 28 YEARS IN THE GALLERY (1990) AND THE 38 YEARS (1980) SINCE BEGINNING MY JOURNEY IN PEN AND INK! FOR QUESTIONS REGARDING COMMISSIONED PIECES, PLEASE EMAIL ME FOR INFORMATION. PRICING FOR ORIGINAL DRAWINGS IS BASED ON TIME, COMPLEXITY, AND SIZE, SO EACH PIECE IS CONSIDERED ON AN INDIVIDUAL BASIS. DRAWINGS START AT $1,500.00. James E. Sabol is an Erie born artist who has concentrated on pen and ink drawings since 1980. His work is primarily focused on subjects of a historical nature, particularly the places, buildings, and landmarks that have been an integral part of the heritage of Northwestern Pennsylvania. From the Presque Isle Lighthouse and the U.S. Brig Niagara, to the historic Warner Theatre, the artist's hand has rendered each scene in the finest detail. This demanding medium is time consuming and difficult, but the effects are unmistakably characteristic of Mr. Sabol's work. For over thirty years the artist has created commissioned works not only for many of the local colleges and universities, banks, corporations, businesses, and hospitals, but also private collectors. Mr.Sabol's work has benefited countless charitable and philanthropic organizations over the the years. The James E. Sabol Studio and Gallery had been in operation since 1990 and closed at the end of 2018 after 28 years in business. In addition to his career as a professional artist, Mr. Sabol had been an instructor of Art at Cathedral Preparatory High School since 1971. He earned his Bachelor's Degree in Art Education from Mercyhurst College in 1970, and a Master of Education (Jewelry and Sculpture studio track) from Edinboro University in 1975. Mr. Sabol retired in 2010 after nearly four decades at Cathedral Prep as the Art Department Chairman. The website is still undergoing changes and updates, so please be patient and check back often. Thanks for your interest in my work.